I live in Woodland heights, and moved here because of its odd nature, eclectic people, cool houses. There used to be guinea hens near my house, just another quirk about the Heights. Until recently there were also chickens running around on Merrill St (and at least one rooster), and just last week I saw ducks on Merrill. I have not heard the roosters in over a year. I get up early, so I enjoyed their morning ritual. I guess not everyone does though, because they’ve been silenced, or eaten. The Heights may be a chicken-friendly place, but evidently City Council isn’t. The Leader reports that the ordinance loosening requirements for raising chickens is just not getting support, and hasn’t made it to subcommittee. 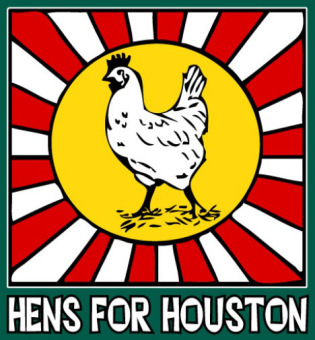 BARC and Hens For Houston in September agreed on a proposed draft with no distance setback for up to eight hens, but a large enough coop would need a building code permit as any other building would. The BARC proposal would allow a permit to have eight hens on the property at one time.